Most children may expect Christmas presents coming on a sleigh driven by reindeer and a jolly man in red, but for dozens of families in Newberg, those presents will arrive on a different kind of vehicle. Since 1929, the Newberg Fire Department and now Tualatin Valley Fire & Rescue has been delivering toys to children in need in Newberg and Dundee. The Toy and Joy program is planned by retired fire department chiefs, firefighters and volunteers, who want to ensure children in need have gifts to open Christmas morning. Stefan Myers, TVF&R public affairs officer, said the long-standing program has grown from where it started to now serving more than 215 families in the Newberg area. He said heading into the holiday season, the training area for firefighters at the downtown station becomes filled with toys staged for wrapping, becoming "Toyland." "What's fun about that is we firefighters trying to customize it," he said of the gifts given. Said gifts are part of an application process to help families in need. The department accepts applications from "families in hard times," Myers said, to ensure the kids have gifts to open on Christmas morning. He added that based on the application, they try to ensure gifts are customized for the child. Fundraising comes from a golf tournament and a pancake breakfast the department holds earlier in the year. The Newberg Fire Department originally staged the event, but TVF&R took it over a handful of years ago. Some years the number of families has fluctuated, going from the 400s in the 1980s, to just 160 in 2016. However, hundreds of children still get to open presents on Christmas morning. "It's a community effort," Myers said. In addition to the fundraising events, Myers said there are other community organizations that help fundraise for the toys, and firefighters help wrap the toys ahead of Christmas Eve delivery. Myers said if anyone sees a firefighter apparatus on Christmas Eve, it probably means they're delivering gifts for a kid to "wake up feeling special" to. Toys are purchased throughout the year, made possible by donations from people in town as well as local businesses. Additionally, a local family donates hundreds of toys to the station each year. The family of Aaron Bowlby, who died 13 years ago, created a tradition of collecting toys for families in need. 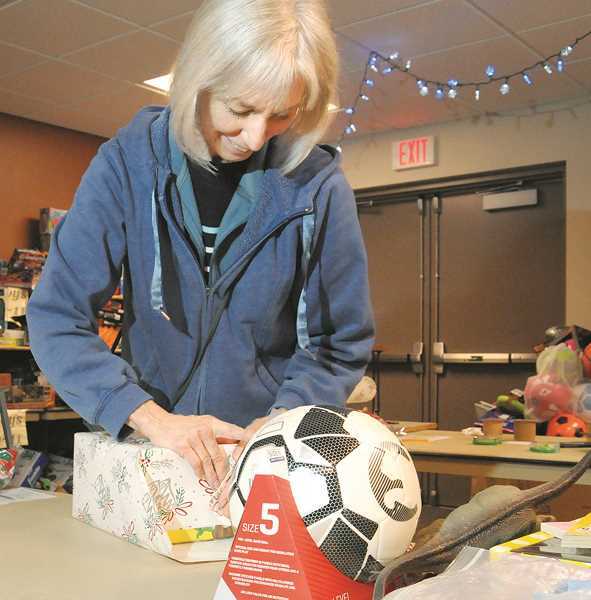 "After a few years, we decided to go public to help give back to the community and started our own toy drive," Janis Bowlby, the boy's mother, told the Graphic last year. "So far, we have collected over 350 toys to donate. I am at awe at how much the people are giving." In 2016, TVF&R took over the toy delivering task. Firefighters will wrap and then deliver all the toys around noon on Christmas Eve, which falls on a Monday this year. Most vehicles will make multiple runs throughout the day to ensure all the gifts get delivered on time. The event generally kicks off after Thanksgiving, when the program begins accepting applications and begins setting up Toyland at the station, ahead of the wrapping. Families in need of some help this Christmas can contact TVF&R in the next couple days and may be able to sign up late. To learn more, call 503-259-1500. The role of "Head Elf" has historically been filled by retired Newberg firefighter Ben Erb, who took on the role in 1970 when the city manager at the time handed him a book of information on Toy and Joy and told Erb he was now in charge of the event.